Special thanks to Barista Pizzeria for extending this food review invitation. The proprietors behind Barista Coffee 'N' Pizza House opened a new outlet 4 months ago. Formally known as Barista Café & Casa De Pizzeria, this eatery is located next to The Boutique Residence Hotel and is within a stone's throw from the bustling Armenian Street (Lebuh Armenian) and Cannon Street (Lebuh Cannon). 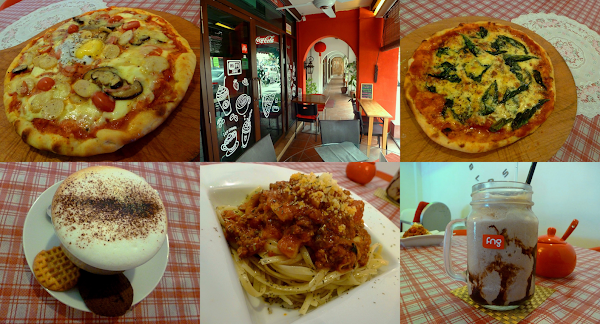 Like the original outlet in Bazaar Tanjung, Barista Pizzeria specializes in hand-tossed pizza, pasta and coffee. There are nearly 20 types of pizzas with various toppings, ranging from chicken to mutton, seafood to vegetarian. Pizzas are made to order and typically take 20 minutes to prepare from scratch. Barista Pizzeria spans the width of two shop units along Jalan Masjid Kapitan Keling. The dining section has air-conditioning, providing much-needed break from the scorching afternoon sun. Background music fills the room with lively character, making this place a great spot to rest and mingle around after a long day exploring the nearby heritage area. Meanwhile, customers who prefer al fresco dining can find a seat along the front corridor of the eatery. Outdoor dining is more viable in the mornings and evenings when the weather is more favorable. At Barista Pizzeria, each pizza comes in standard size of 11 inches and is served on a wooden peel. Typically, the pizza uses 3 types of cheese (colby, cheddar, mozzarella). Parmesan is sometimes used as the fourth. Dried Italian herbs and olive oil help to enhance aroma, which permeates the entire dining room with lovely fragrance as soon as the pizza comes out from the oven. English Breakfast Pizza (RM24.00) was introduced to the menu recently and has toppings that are typical of English breakfast: chicken sausage, turkey bacon, mushroom, cherry tomato and egg. The egg is at the center is reasonably runny when served, resembling half-boiled egg that many people enjoy as breakfast. This pizza is usually given a light drizzle of mustard, but mustard sauce is unfortunately in low supply today. Meanwhile, the Queen Margherita Pizza (RM21.90) is a type of Neapolitan pizza customarily topped with basil leaves, cheese and tomato sauce. The tomato sauce is infused with some cheese, making it rich in flavor on its own. In addition, the pizza also includes 3 types of cheese - all molten as a sticky layer above the crust. I find this pizza quite enjoyable and would certainly recommend it to anyone who loves basil. The pasta section of the menu has a handful of spaghetti and linguine recipes. Fusion Mutton Bolognese (RM16.00) is probably one of the more special ones. A heap of linguine, cooked al dente, is topped with savory minced mutton and tomato gravy. Grated parmesan cheese, parsley and Italian herbs provide the finishing touch to this appetizing pasta dish. Barista Pizzeria's menu has a reasonably complete range of coffee drinks. Coffee beans are supplied by illy, a reputable coffee roaster from Italy with worldwide recognition. Each cup of coffee comes with a couple of cookies for good measure. Meanwhile, non-coffee drinkers can order from a list of non-caffeinated drinks such as soda, fruit juice and milkshake. Beer is also available. Doppio (RM6.95) means "double" in Italian, or in coffee parlance, refers to double shot espresso. This is the best way to appraise illy's coffee in its purest form. Café Latte (RM7.95) consists of single shot espresso, abundance of steamed milk and a thin layer of milk foam. This hot drink is served in a tall transparent mug to showcase its smooth, homogeneous consistency. Cappuccino (RM7.95) is similar to Café Latte but typically comes in smaller volume. Cappuccino contains equal parts of espresso, steamed milk and milk foam, making the top foam layer rather thick and appealing. A sprinkle of cocoa powder is added on top for aesthetic appeal. Next is an iced coffee drink which enjoys widespread popularity in Italy. Shakerato (RM8.95) consists of two shots of espresso, milk and ice cubes - all shaken thoroughly in a cocktail shaker. The original version of Shakerato in Italy usually does not include milk. As for coffee granita (iced blended coffee), there are also several interesting types to choose from. Mocha Invasion (RM11.95) is prepared from espresso, milk, chocolate syrup, coffee ice cream and ice cubes. Whipped cream and chocolate fudge serve as icing on the cake. Besides dine-in customers, Barista Pizzeria also caters for private parties between 15 and 50 people. Party packages are attractively priced from RM13.90 per adult and RM7.90 per child, and typically include several types of pizza, soup, salad and drinks. Birthday cake and live performance can also be arranged upon request. Directions: Barista Pizzeria is located towards the end of Jalan Masjid Kapitan Keling, near the intersection with Armenian Street (Lebuh Armenian) and Cannon Street (Lebuh Cannon). As a tourist spot, parking in this area is quite limited. Chances are that you need to park several streets away and walk here on foot.